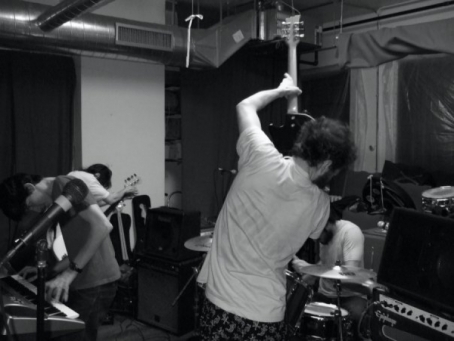 From Jake's report of day 3 of the CMJ Music Marathon 2014: "Virginia's Malatese (from Harrisonburg, which JUST makes it into the area of our coverage) plays something that may be referred to as post-no-wave-pre-post-pre-punk music. 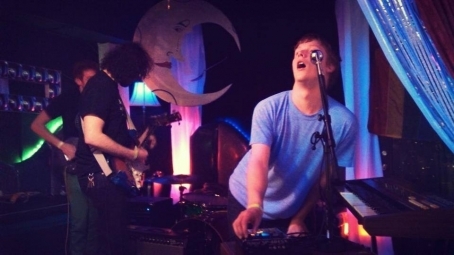 Their melodies/jams/grooves/whatever you wanna call 'em are dissonant and aggressive, drowned under a wave of distortion and Travis' noisy vocals. Their music is already a little strange and head-tilt inducing, but Travis adds this extra little element of weird that brings it to a level of ingenuity. First of all, he runs his vocals through a 404 sampler, using all the weird delay or pitch bending effects to add this monstrous ambience. He's also got a generally hilarious stage presence, what with this funny shake dance that he does, all the weird noises he randomly spews out and the funny faces. He's not afraid to look like a little stupid up there because he's having good ol' tortured fun, which in turn means I'm having fun; if he brought it to an even further level of crazy he could be a regular Iggy Pop. "